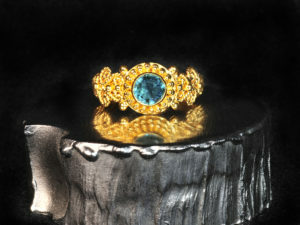 This is an 22k solid gold ring with a beautiful blue tourmaline. 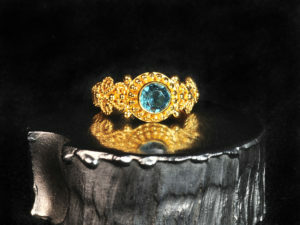 The design is based on an ancient Etruscan style with intricate twisted wire details. 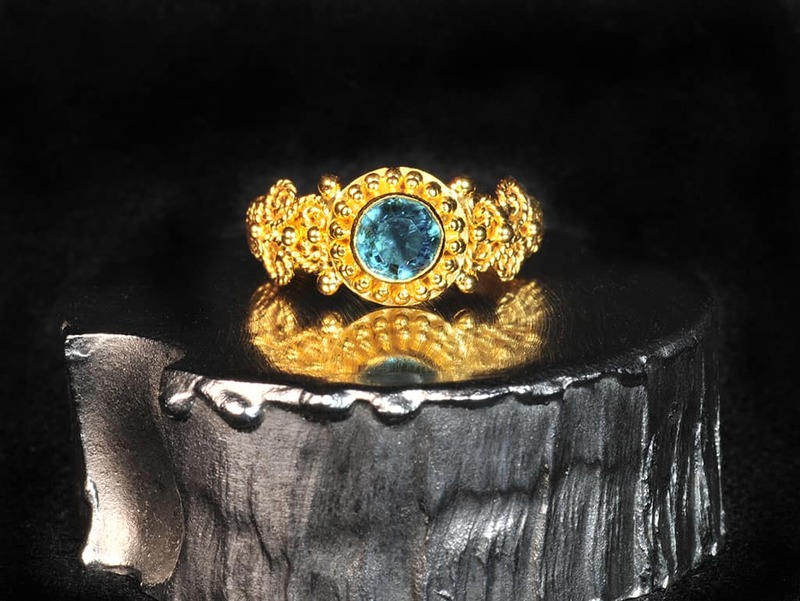 The gemstone is from Namibia (the Erongo mine) and is some of the best blue tourmaline I have seen. 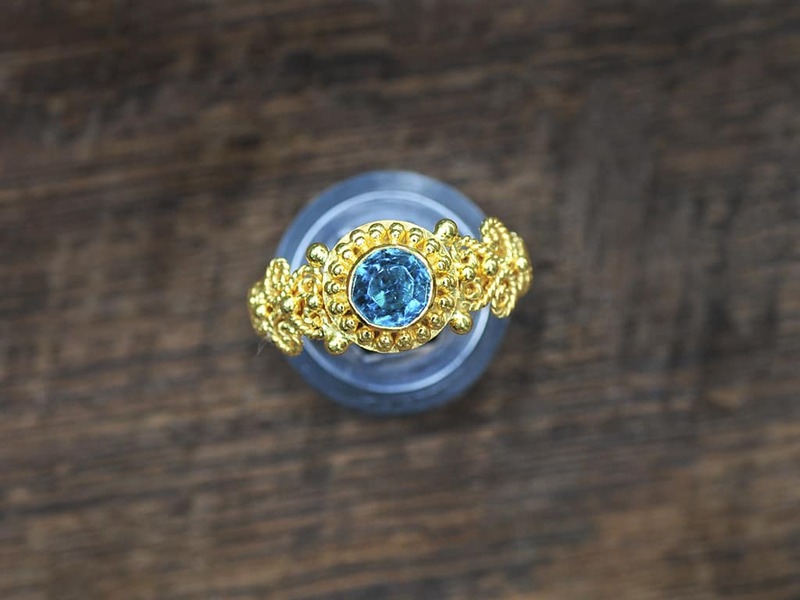 It is clean and bright and has a deeply saturated blue color that is not too dark not too light. 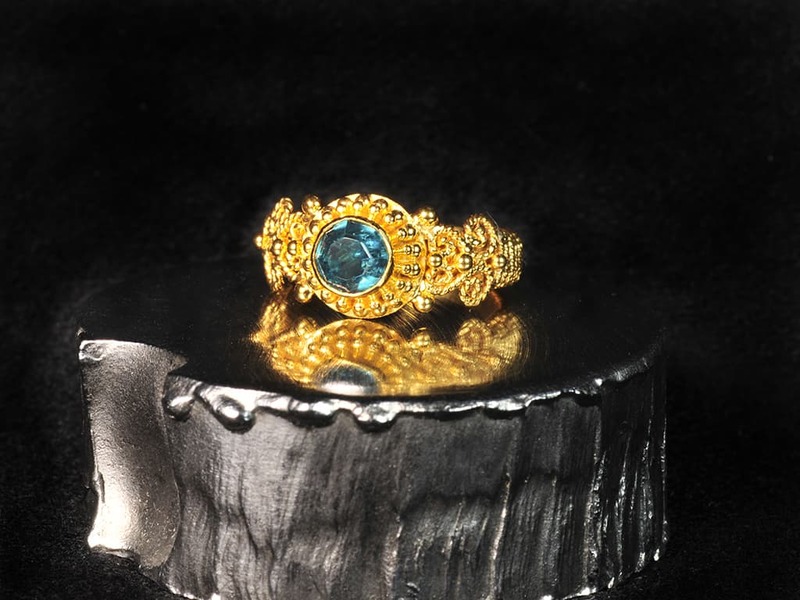 I recently acquired the material to make this ring and while it is beautiful, larger clean pieces are extremely rare. Like a lot of gemstones, this piece will appear to have some variation in color under different lighting and conditions. The first five photos in the series were taken under studio lighting while the 6th or last photo was taken outdoors in natural light. The ring at its widest point is approx. 3/8” wide (at the front) and the band is approx. 1/8” wide at the back. Learn more about Tourmaline at this link. 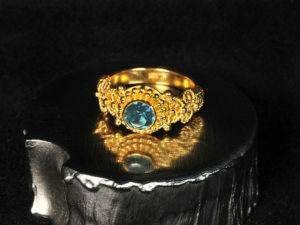 Ancient Roads Jewelry ships only to addresses within the United States. We ship by Fed-Ex ground service for a flat rate of $22.00. Shipments usually take 3-5 business days. If you want expedited shipping service please contact us for options and cost. We can only ship to the billing address listed with your credit card issuer. All shipments require a signature for delivery. If you are not happy with an item, we will refund the standard flat rate shipping charges ($22.00) to you if the item is returned in undamaged and unaltered condition with it’s original gift box (see Return Policy below). We accept Visa or Mastercard and use a PayPal “payment gateway” to process payments. You can absolutely pay with a credit card using this payment gateway if you don’t have a PayPal account. In addition, you may also make a purchase with PayPal which allows you to debit your bank account or utilize a credit card without having to go through the trouble of entering your shipping/billing information on the payment gateway. We do not store any credit card information from purchasers as this is all facilitated by PayPal. Sales tax will be collected on all orders shipped within the state of Colorado. If you see an item that you want made in a specific size I do take special and/or custom orders. Please contact me either by email or phone to discuss any requests you might have for custom items. Please be aware that I will need a deposit of 50% of the agreed price of the item before work can commence. 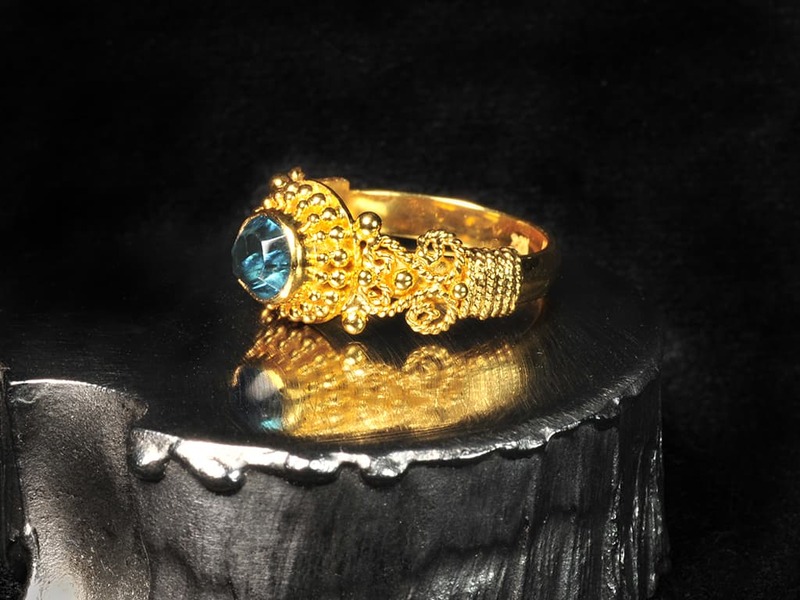 For some items I may only be able to give you a range for the final price of the item because it may be difficult to estimate the amount of gold that will be required to produce the piece. 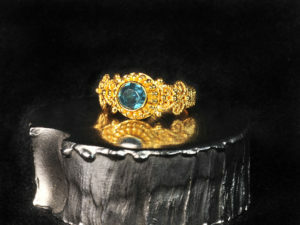 Finally, special and custom orders typically take between 2-3 months to be made. If you are not happy with your purchase or have a problem with the fit of an item please contact me to arrange for a return/exchange as soon as possible (or within 10 days). Items must be in original unaltered, undamaged and unused condition to be considered for a full refund/exchange. Return shipping costs will be paid by purchaser and I recommend that you return ship using an express package carrier such as FedEx or registered and insured mail. Ancient Roads Jewelry cannot be responsible for lost or damaged return shipments. 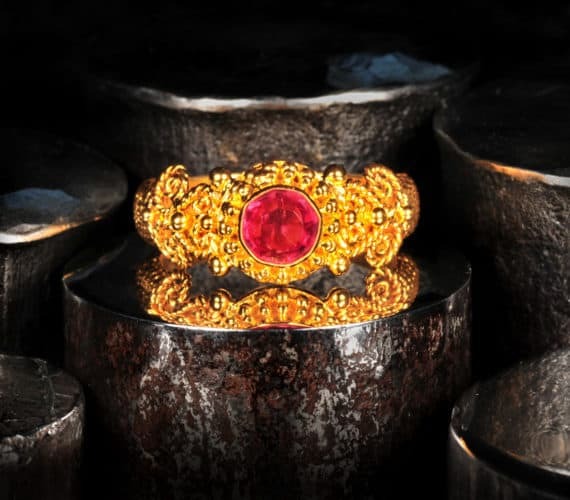 Ancient-Roads Jewelry warranties its product against defect for a period of 90 days from date of purchase. Defects are defined as a problem or fault with the materials used to make an item or the original construction/fabrication of an item. Please contact me if you have a problem or an issue with any item purchased from Ancient-Roads Jewelry. I will attempt to repair any item determined to be defective within a reasonable amount of time but if an item cannot be repaired a refund will be given. If an item is damaged or needs repair outside of the warranty period please contact me as I may be able to have it repaired at nominal cost and will be happy to do so. Have a question? Feel free to call or e-mail me.